Given that planters, estate staff and workers are synonymous with the tea industry, having played a significant role in ensuring the tea industry survived for 150 years in Ceylon/Sri Lanka, the above is an event eagerly looked forward to by planters, staff on estates and workers who were the architects in ensuring the tea plantations thrived or, more appropriately in the context of Sri Lanka’s industry, survived. The organising committee of the festivities wrote to all retired tea planters asking for details of their record in the industry giving them the impression that they were to be part and parcel of the ensuing celebrations. Alas, this was not to be so. The “Registration Form” received from the secretariat handling the festivities required those who were not members of the Ceylon Tea Trades Association (CTTA) to pay the astronomical sum of Rs. 40,000 per head to participate in such festivities; resulting in all retired planters who are not members of the CTTA, being required to make such a payment whilst members of the CTTA had to pay a reduced amount of Rs. 30,000 and if they were fortunate enough to be under 35 years of age, a subsidised sum of Rs. 25,000. One need not labour the point that when one is retired, it would be virtually impossible to cough out the princely sum of Rs. 40,000 per head even for an event you spent your whole life in ensuring happened, a fact that appears to have been ignored by the organisers probably due to their target audience being others who, even paying a reduced amount, are all employed by corporates who will obviously make payment on their behalf. When the “flyer” (see picture) forwarded along with the “Registration Form” is perused, one could see that those who should register are growers, brokers, those in packaging; exporters and importers, logistics and shipping, research institutes, financial institutions, competitors, innovators and buyers, all of whom, other than the research institute, are in fact those whose business exists, survives and in fact thrives due to the tea industry. Bafflingly, the term PLANTER, used for the last 150 years, is absent! It is believed that the Sri Lanka Tea Board is the main organiser and sponsor of the planned festivities and for reasons best known to them, entrusted the CTTA to attend to matters regarding the festivities. The CTTA conveniently appears to have overlooked the fact that it was the working planter, estate staff and workers who faced all the adversities that were prevalent and toiled with great personal sacrifice, with the planters alone losing 18 of their number who were brutally murdered in carrying out their duties during the past JVP led insurrection, circa 1987-1989. A question would be, were any of the organisers of the celebration – the exporters, traders and brokers, all of whom were living and working safely in the city, subjected to what the planters were subjected to? The answer – NO! Inquiries as to why this absurd situation has arisen brought forth the ludicrous response that this is a “corporate event” (which is evident from the indication in the “flyer” on “who should register”) and the high cost of having the festivities in Colombo (including a beach party) has resulted in the high costs to be levied. This is ridiculous to say the least! If celebrations of the 150 years of the tea industry in Sri Lanka are to be held, they should be held at least in part in the heart of the tea growing part of the country which is the Dimbula and Dickoya districts. Both Darrawella and Radella Clubs, both of which are as old or older than the tea industry itself, are available. The Tea Research Institute (TRI) is situated in the Dimbula district. The Darrawella and Radella Clubs as well as the TRI have played very significant roles in the continuance of the industry and the industry reaching this historic milestone and should have therefore played significant roles in the planned celebrations. It would also be relevant to state that when the 100 years of Ceylon Tea was celebrated in 1967, all the events to commemorate the occasion were at the Radella and Darrawella Clubs as well as the TRI. Foreign delegates were hosted by planters in the district and it was a celebration in the true traditions of Ceylon planting and planters. The organisation of the festivities in 1967 was handled by the Planters Association (when the Chairman of the Association was a working planter) and the Ceylon Planters Society and not by organisations such as the CTTA whose creation, existence and survival depends on the planters and the plantation industry. Alas in 2017, in the organising of the festivities connected with the milestone of “150 years of Ceylon Tea”, the Planters Association and the Ceylon Planters Society have been ignored and organisations such as the CTTA, which has not even been in existence for as long as the tea industry has been in existence in Ceylon/Sri Lanka, tasked with organizing the celebrations. The 150 years of the Nilgiri Planters Association (NPA) in India was commemorated in 1991. The festivities were all held in the Nilgiri’s. The NPA ensured that all participants were shown how the industry there had progressed by taking them to selected estates and it was a commemoration and celebration enjoyed by all and not conferences or gala dinners or beach parties in the metropolis as is being planned in Sri Lanka! In Sri Lanka, however, the celebrations of 150 years of Ceylon Tea are being held furthest from the heart of the tea plantation districts; in fact, in the metropolis and on the beaches where tea will not even grow!! Further, a planned event at the celebrations is a “Charity Auction” which clearly indicates that the organisers are moving the focus of the celebrations from the actual growing of tea to the marketing of Tea which is not surprising as the CTTA is the main organiser. With this the short sightedness of those organising the festivities is evident and one wonders whether these arrangements have been made to boost the image of the organisers instead of the fact that the industry is 150 years old!! One cannot also help but wonder whether the celebrations to mark the milestone of 150 years of Ceylon tea was planned to take place in Colombo as the organisers are of the opinion that Sri Lanka’s industry has nothing positive or encouraging to show even after 150 years and especially in the last 25 years. This is absurd to say the least as though the state and productivity of plantations are not what they should be, there are some great achievements to be proud of on some estates. In all probability, the organisers would have been compelled to have all events connected with the celebrations in the metropolis as the tea planting areas are alien to them. Yet another point so correctly stressed by Feizal Samath, Business Editor of the Sunday Times in his recent article “Dignity of the Plantation Worker” published in the column “Kussi Amma Sera” (the kitchen files), is the fact that the staff and workers on estates, who toiled to ensure the industry lasted for 150 years, have been ignored. If it was actually a celebration to mark the historic occasion, would it not have been a magnanimous gesture for the Regional Plantation Companies and the Sri Lanka Tea Board to have selected around 20 members each from among the estate staff and workers and send them on an educational tour to visit plantations overseas? With so much being heard of the magnificent manner plantations of James Finlay’s are being managed in Kenya, with James Finlay’s involvement in the plantation industry in Ceylon/Sri Lanka in the past and even now, it is absolutely certain that Finlay’s would agree to take these staff/workers from Sri Lanka around their plantations in Kenya and possibly even host them during their stay in Kenya! (Kussi Amma Sera also raised this in his May 21 column saying “A 3-4 day holiday tour abroad for a representative group of workers sponsored by the state or the plantation industry might give these workers some dignity and not leave them completely out of the tea party). It is a fact that in any industry, those who actually physically work to keep it going are those who are the most important. Where the plantation industry is concerned, the planters, staff and workers on estate are those who by their dedicated and untiring efforts ensured the industry continued despite the numerous problems it faced. Brokers, buyers, exporters and others all came into being and exist and even prosper due to all that the planters, staff and workers on estates did and continue to do. Therefore, it is with much sadness that on the occasion of 150 years of Sri Lanka tea, those who actually toiled in ensuring the industry survived are being “shut out” while others whose creation, existence and prosperity depended on what the plantations produced are getting credence in the celebrations! A salient point is that the tea industry is currently in dire straits. However, these hard times have not affected the brokers, buyers, importers and exporters and others who have been invited to register. In fact, all of them ironically are thriving at the expense of the tea industry! With the planters who actually ensured the industry survived for 150 years being “shut out” of the celebrations to mark this significant milestone and even the nomination of participants from Regional Plantation Companies being a bare minimum, the celebrations should probably be more appropriately be referred to as the: “Celebration of the 150th Anniversary of Ceylon Tea by those whose creation, survival and prosperity depended and even now depends on the Tea Industry in Sri Lanka”. An example of what is to take place is similar to that of one who decides to buy an Audi (the standard vehicle of the elite in the tea trade). Would he prefer speaking to a smooth talking, nattily attired salesman trying to sell a product produced by another or prefer to speak to a robust, overall clad Engineer, who planned, toiled, burnt the midnight oil, neglected his family, kept his workers happy and content and made many more sacrifices in producing a masterpiece of a vehicle? The answer is obvious. It is hoped that, even at this late stage, sanity will prevail and the legitimate request by planters and ex-planters to attend the event at an affordable cost will be acceded to. 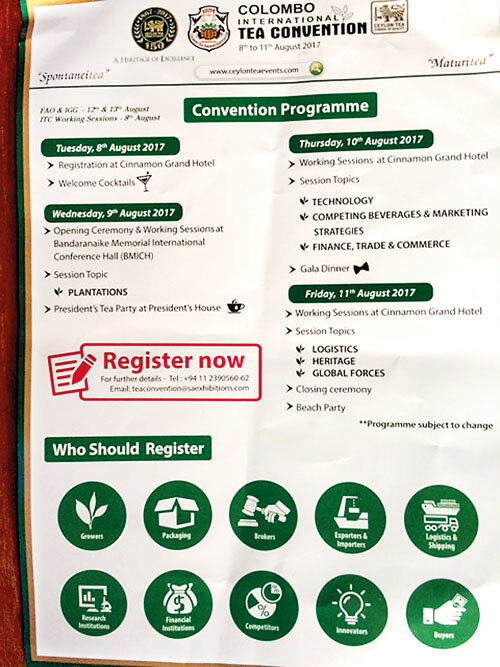 Surely, the foreign delegates who are due to attend will be more interested in sharing their experiences with their local counterparts, who were actually involved ensuring the tea industry existed for 150 years and not be “pestered” by “salesmen” trying to promote their businesses and/or hearing about the problems that are claimed to have been caused to the industry by the ban on the weedicide Glyphosate! It is also hoped that the staff and workers, who also toiled to ensure the industry continued, are not forgotten and the proposal made to send 20 of them (or even more) on an educational tour to Kenya will be accepted. In conclusion, the efforts of the Chairman of the Sri Lanka Tea Board, Rohan Pethiyagoda, to include the planters in the celebrations at an affordable cost are gratefully acknowledged but even the efforts of this distinguished personality have been to no avail. Based on what is happening in this, the 150 years of Ceylon Tea – GOD HELP CEYLON TEA! (The writer was a planter and is currently President of The Mascots – an association of ex planters of the Maskeliya and Upcot districts. He can be contacted by email – devakaw@sltnet.lk). CB to liquidate six ‘bad’ finance cos.
Spilling the beans, mistress and all!